Lens Description: The Horseman VCC Pro is an exciting precision tool that uses its bellows functions to basically turn your Nikon or Canon DSLR into a full-featured view camera. Tilt, swing, shift, fall and rise are normal view camera movements but rarely applicable to DSLRs. Using specially chosen Rodenstock lenses, the VCC Pro allows creative or corrective perspective and depth of field control in-camera instead of in post-production.rnrnThis Rodenstock Apo-Rodagon-N 105mm f/5.6 Lens for the VCC Pro by Horseman has a tried-and-true 8-element design with edge-to-edge high contrast and superior resolution. Of course, Apo means color rendition of the highest order and this lens completely eliminates even the most minor color fringing to give you images that give new emphasis to the word, \"vivid.\" It is recommended for 2-15x reproduction and although intended for the 24 x 36mm format, the Apo-Rodagon-N 105mm f4.0 provides coverage up to 6 x 9 cm. The larger image circle means a greater range of movements with the VCC Pro. It also means that you can use the lens in your enlarger for those Horseman or RZ negatives. 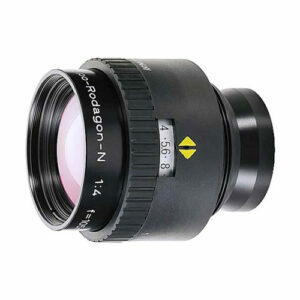 With the addition of a Rodenstock Modular-Focus device you can use it on a CCD camera as well. The 105\'s convenience features include Aperture Pre-select, Illuminated f/stop Display and Click-stop Disable for stepless f/stop selection.